Króliczak, G., & Biduła, S. (2016). Widzenie. W: Przewodnik po kognitywistyce (red. Józef Bremer SJ). Seria: Przewodniki po filozofii. Wydawnictwo WAM, 367-390. ISBN: 978-83-277-0199-2. Króliczak, G., & Biduła, S. (2013). Neuronalne podłoże gestów komunikacyjnych u osób leworęcznych. Nauka, 3, 99-131. 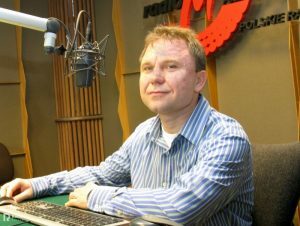 Karaśkiewicz, A., & Lubawy, M. (2012) Wpływ pasków informacyjnych na zapamiętywanie pozostałych elementów przekazu telewizyjnego. Studia medioznawcze, 51(4): 69-81. Króliczak, G., & Biduła, S. (2012). Lateralizacja języka i gestów: metody badań, zależności oraz uwarunkowania anatomiczne. Studia z Kognitywistyki i Filozofii Umysłu, 6(1):143-163. Buchwald, M., & Króliczak, G. (06-2016). Planning functional grasps of tools vs. non-tools – decoding conditions from brain activity. Poster presented at the 22nd Annual Meeting of the Organization for Human Brain Mapping, Geneva, Switzerland. Pawlak, M., Przybylski, Ł., Styrkowiec, P., Reuter, M., Nowik, A., Kroliczak, G. (06-2016). Brain volume fluctuations within 30 hour interval – clinical biomarker evaluation. Poster presented at the 22nd Annual Meeting of the Organization for Human Brain Mapping, Geneva, Switzerland. Styrkowiec, P., Przybylski, Ł., Reuter, M., Nowik, A., & Króliczak, G. (06-2016). 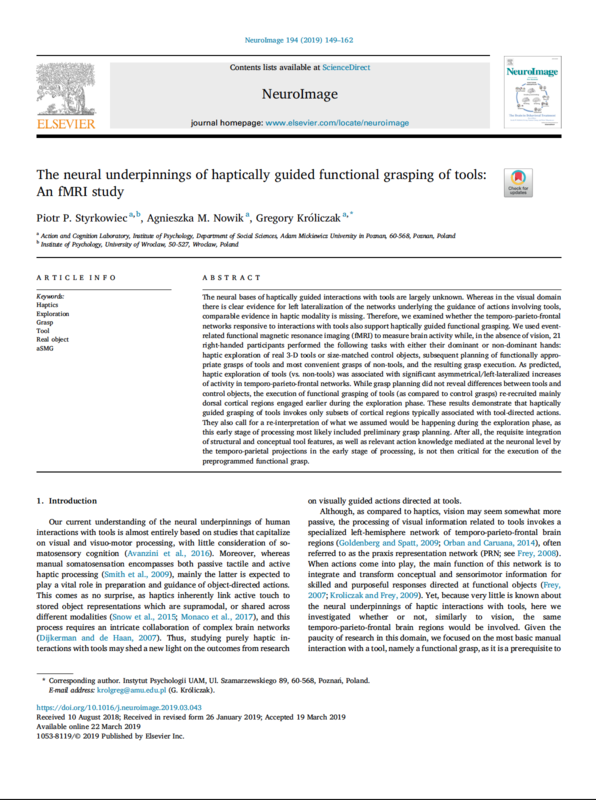 Haptically guided grasping of common tools: a functional magnetic resonance imaging (fMRI) study. Poster presented at the 22nd Annual Meeting of the Organization for Human Brain Mapping, Geneva, Switzerland. Króliczak, G. (05-2016). Dominacja półkulowa i ręczność, a ogólna organizacja funkcji mózgu: mity w konfrontacji. NeuroMania IV: konferencja studencko-doktorancka, Toruń. Kubiak, A., Króliczak, G. (05-2016). Co o reprezentacji gestów symbolicznych mówi nam paradygmat adaptacji fMRI? NeuroMania IV: konferencja studencko-doktorancka, Toruń. Potok, W., Marangon, M., Króliczak, G. (04-2016). 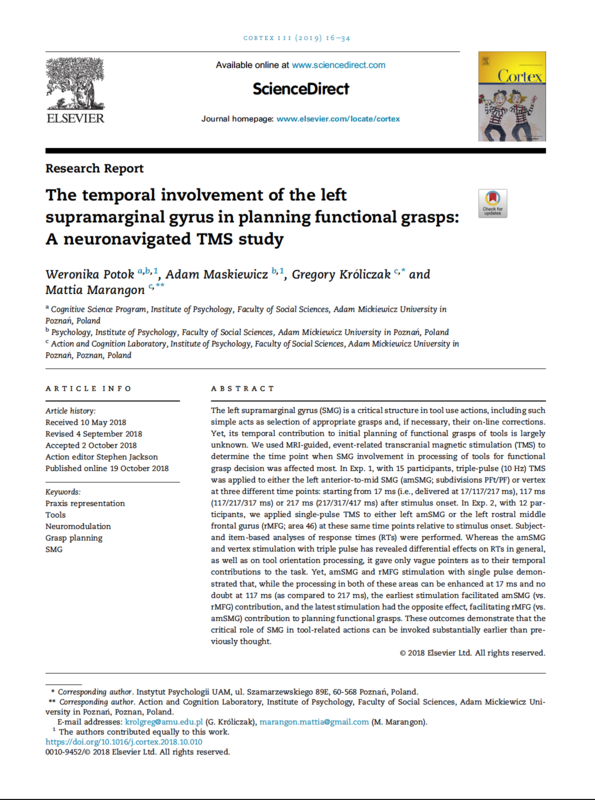 The temporal involvement of the left supramarginal gyrus in planning functional grasps. Research Talk at the NEURONUS 2016 IBRO & IRUN Neuroscience Forum, Kraków, Poland. Buchwald, M., Przybylski, Ł., Króliczak, G. (04-2016). Planning functional grasps of tools vs. non-tools – MVPA searchlight analysis. Poster presented at the NEURONUS 2016 IBRO & IRUN Neuroscience Forum, Kraków, Poland. Raś, M., Nowik, A. (04-2015). 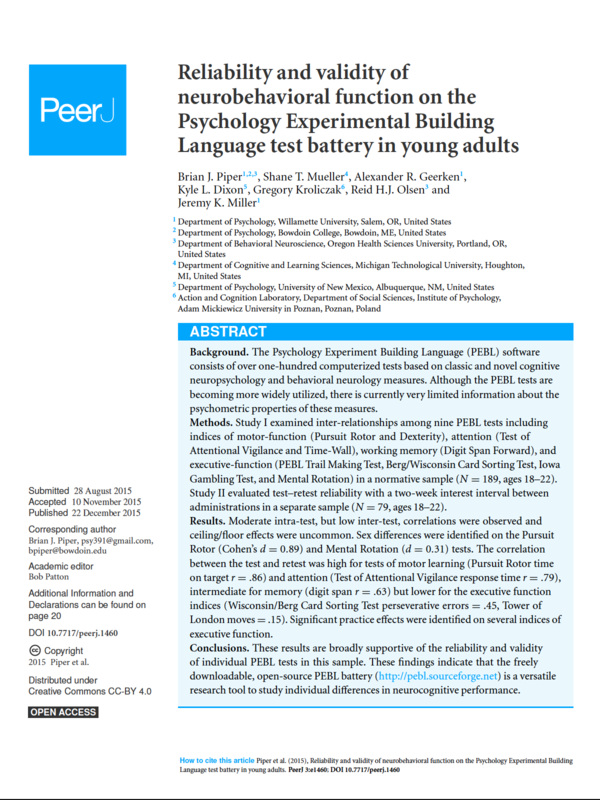 Non-physical abstract actions are also caused by brain activity: evidence from EEG. Poster presented at the NEURONUS 2015 IBRO & IRUN Neuroscience Forum, Kraków, Poland. Bidula, S., Przybylski, L., Pawlak, M., & Kroliczak, G. (08-2014). The control of functional grasp is dissociated from object use: evidence from left-handers. Poster presentated at the 37th European Conference on Visual Perception, Belgrade, Serbia. Przybylski, L., Bidula, S., Pawlak, M., & Kroliczak, G. (08-2014). Dissociation between the control of functional grasp and object use in right-handers. 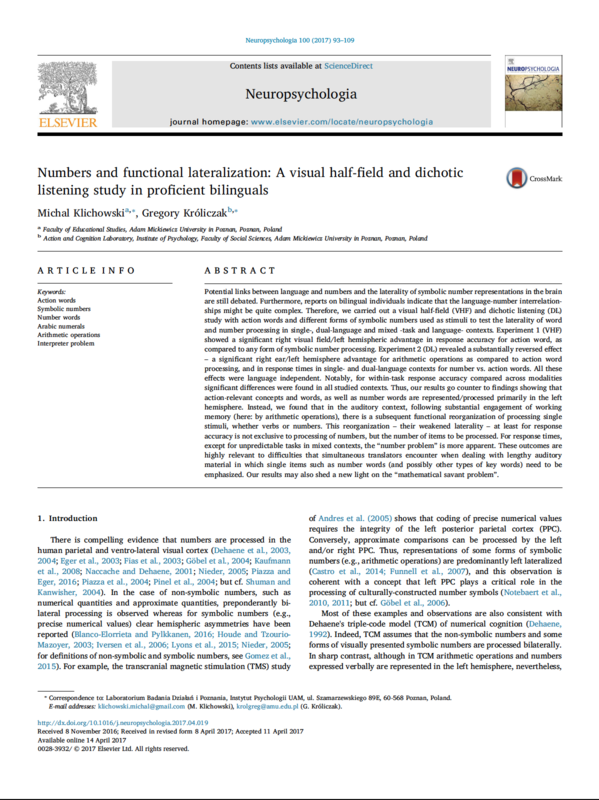 Poster presented at the 37th European Conference on Visual Perception, Belgrade, Serbia. Króliczak, G. (06-2014). On the Other Hand: Perspectives on the Right Organizational Structure in the Brains of Individuals with Atypically Lateralized Functions. Invited Lecture at the Explaining the Mind. Perspectives on Explanation in Cognitive Science conference, the Copernicus Center for Interdisciplinary Studies, Kraków, Poland. Przybylski, L., Bidula, S., Pawlak, M., & Kroliczak, G. (06-2014). Neural bases of planning functional grasps in left-handers: a functional magnetic resonance imaging (fMRI) study. Poster presented at the 20th Annual Meeting of the Organization for Human Brain Mapping, Hamburg, Germany. Pawlak, M., Przybylski, L., Bidula, S., & Kroliczak, G. (06-2014). White matter microstructure asymmetry in left-handers: a diffusion tensor imaging study. Poster presented at the 20th Annual Meeting of the Organization for Human Brain Mapping, Hamburg, Germany. Kroliczak, G., Przybylski, L., Bidula, S., & Pawlak, M. (05-2014). 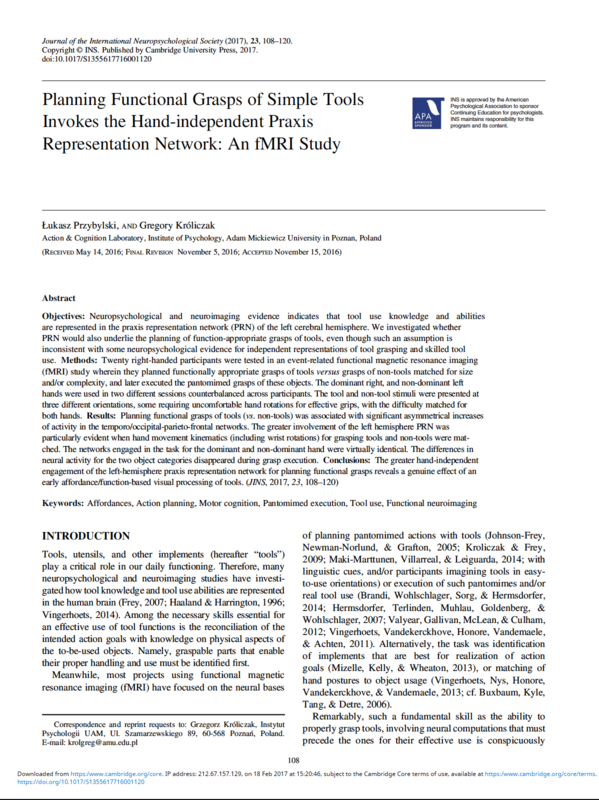 Hand-dependent and hand-independent cerebral asymmetries in the praxis representation network during planning of functional grasps. Poster presented at the 14th Annual Meeting of the Vision Sciences Society, St. Pete Beach, FL, USA. Przybylski, L., Bidula, S., Pawlak, M., & Kroliczak, G. (05-2014). Neural bases of planning and execution of functional grasps: an fMRI study. Poster presented at the 14th Annual Meeting of the Vision Sciences Society, St. Pete Beach, FL, USA. Biduła, S., Przybylski, L., Pawlak, M., & Kroliczak, G. (04-2014). Modulations within the right temporal lobe differentiate between typically and atypically organized language. Research talk at the NEURONUS 2014 IBRO & IRUN Neuroscience Forum, Kraków, Poland. Kubiak, A., Nowik, A., Reuter, M., & Michałowski, B. (04-2014). Inhibitory Control in Nonsuicidal Self-Injury: Even-Related Potentials in the Stop-signal Paradigm. 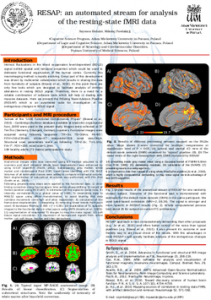 Poster presented at the NEURONUS 2014 IBRO & IRUN Neuroscience Forum, Kraków, Poland. Mańczak, B., Kubiak, A., Michałowski, B. & Nowik, A. (04-2014). Does the McGurk stimulus evoke the Mismatch Negativity? 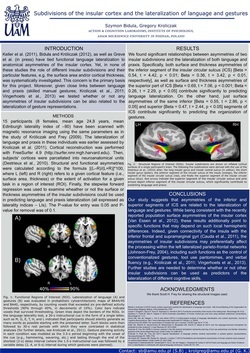 Poster presented at the NEURONUS 2014 IBRO & IRUN Neuroscience Forum, Kraków, Poland. Michałowski, B. & Króliczak, G. (04-2014). Effectiveness of visual half-field paradigms in assessing the asymmetries of object representations. Poster presented at the NEURONUS 2014 IBRO & IRUN Neuroscience Forum, Kraków, Poland. Króliczak, G. (04-2014). The organization of gesture and language, and their relationships to hand dominance. 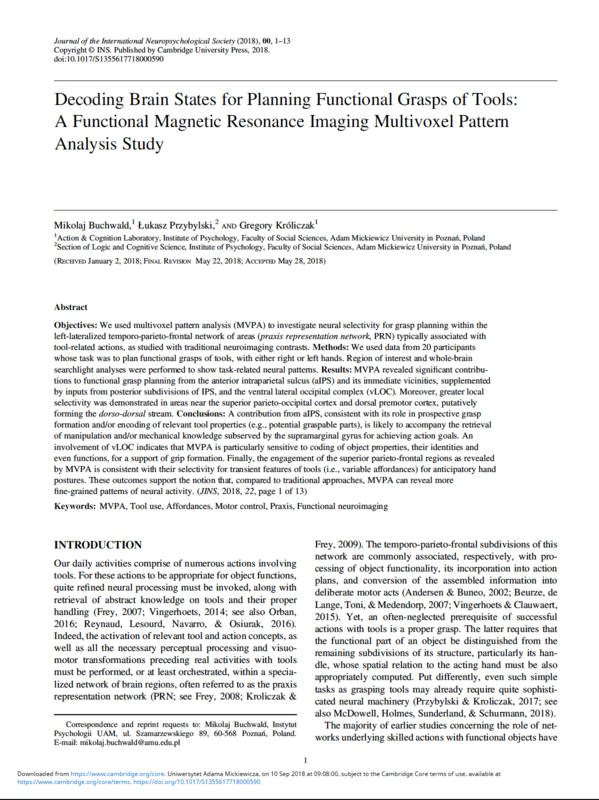 Evidence from functional magnetic resonance imaging (fMRI). Plannary lecture at the Young Linguists’ Meeting in Poznań 2014. Kubiak, A., & Króliczak, G. (03-2014). The involvement of the precuneus and medial prefrontal cortex in communicative gestures. Poster presented at the Interdisciplinary College (Focus Theme 2014: “Cognition 3.0 — the social mind in the connected world”), Günne at Lake Möhne, Germany. Michałowski B., & Króliczak, G. (09-2013). Hemispheric asymmetries for visual processing of tools in left-handers. Poster presented at the 11th International Congress of the Polish Neuroscience Society, Poznań, Poland. Biduła, S., & Króliczak, G. (09-2013). 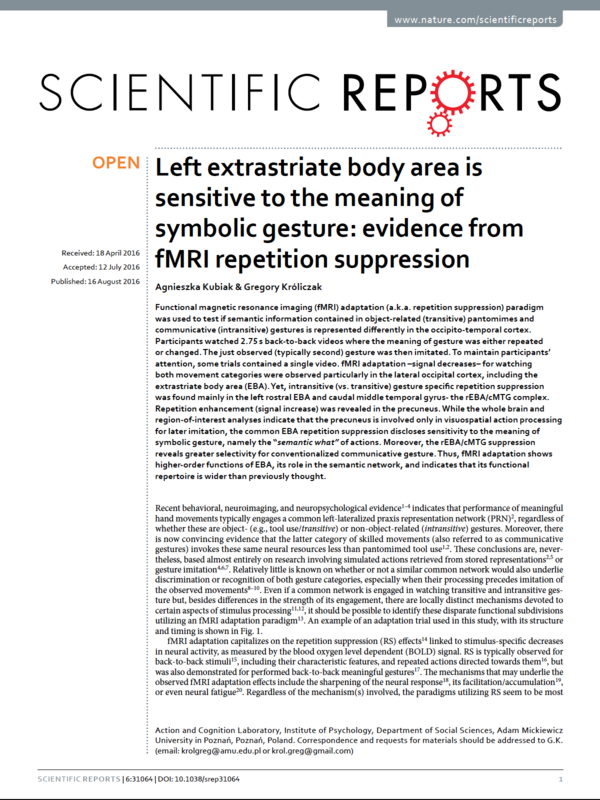 Cortical asymmetries and the lateralization of gestures and language in left-handers. Poster presented at the 11th International Congress of the Polish Neuroscience Society, Poznań, Poland. Króliczak, G. (09-2013). Task-dependent dissociations between transitive and intransitive gesture representations. The prospects of recovery following right vs. left hemisphere lesions. Research talk at the 11th International Congress of the Polish Neuroscience Society, Poznań, Poland. Biduła, S., Króliczak, G. (06-2013). Subdivisions of the insular cortex and the lateralization of language and gestures. Poster presented at the 19th Annual Meeting of the Organization for Human Brain Mapping, Seattle, WA, USA. Biduła, S., & Króliczak, G. (06-2013). Insular asymmetries and the laterality of functions in a healthy brain. Poster presented at the ‘Brain Plasticity, Learning and Education’ symposium organized by Royal Society of Canada, the Israel Academy of Sciences and Humanities, and the Canadian Institute for Advanced Research. The University of Western Ontario, London, Ontario, Canada. Króliczak, G. (05-2013). 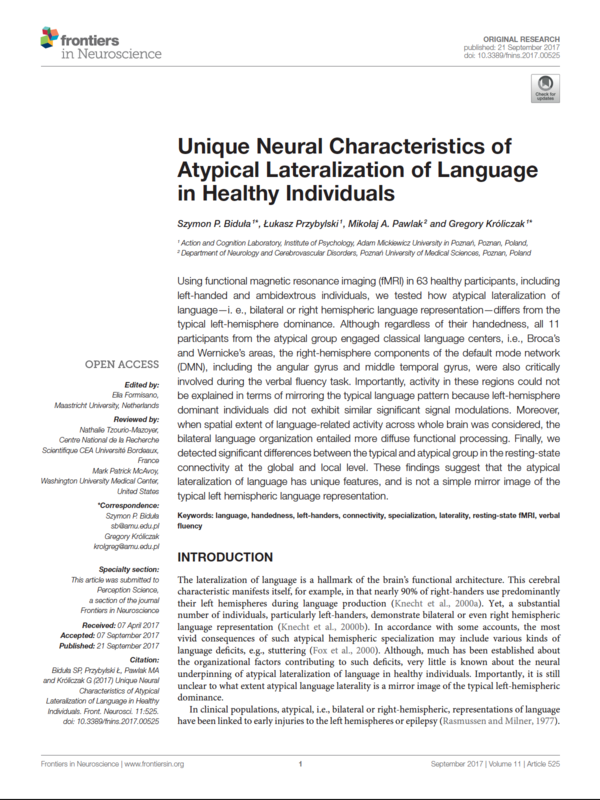 An fMRI study of perception and imitation of transitive and intransitive skills. Research talk at the NEURONUS 2013 IBRO & IRUN Neuroscience Forum. Kraków, Poland. Biduła, S. (05-2013). Is the precuneus part of the default network? NEURONUS 2013 IBRO & IRUN Neuroscience Forum, Kraków, Polska. Biduła, S., & Pawlak, M. (05-2013). Laminar analysis of resting state blood oxygenation level dependent signals at 7T and 3T. 4th Annual Scientific Symposium on Ultrahigh Field (UHF) Magnetic Resonance, Berlin, Niemcy.